There are about 5,100 Tatars in China, most of whom live in Yining, Tacheng and Urumqi in the Xinjiang Uygur Autonomous Region. The Tatars’ history in China dates from the Tang Dynasty (618-907), when the Tatar tribe was ruled by the nomadic Turkic Khanate in northern China. As this state fell into decline, the Tatars grew in strength, and their name was used to refer to several tribes in the north after the Tang Dynasty. Their homeland was later annexed by Mongols, and when the Mongols pushed west, many Central Asians and Europeans called them Tatars. In the mid-13th century, Batu, the grandson of Genghis Khan, established the Golden Horde Khanate in Central Asia. It began to decline in the 15th century, and the Kashan Khanate began to rise on the middle reaches of the Volga River and in areas along the Kama River. The rulers of the Kashan Khanate, to boast their strength, began calling themselves Tatars, the sons of the Mongols. Tatar gradually became the recognised name for the inhabitants of Kashan Khanate. Today's Tatar ethnic group was formed through a mixture of the Baojiaer people, Kipchacks and Mongolians over a long period. After the 19th century, the serfdom crisis in Tsarist Russia worsened, and serf owners intensified their plundering of land. Most of the Tatars' land along the Volga and Kama was grabbed, and the inhabitants forced to flee. Some went south to Central Asia and then on to southern Xinjiang. In the late 19th century, Tsarist Russia expanded into Xinjiang, and won trade privileges there. For a time, Russian merchants traveled to Xinjiang, and were followed by Tatar merchants from Kashan. Many stayed in Xinjiang to trade. During this period, many Tatar intellectuals and clerics moved to Xinjiang. Up to the early 20th century, a continuous stream of Tatars came to Xinjiang from Russia. The Tatar language belongs to the Turkic language family of the Altaic language system. Because the Tatars mix freely in Xinjiang with the Uygurs and the Kazaks, the three languages have had strong effects on one another, and have produced various local dialects. The Tatars' written language is based on Arabic letters. The Tatars' educational development began in the late 19th century when Tatar clerics opened schools in several areas. Besides the Koran, Islamic history and Islamic law, these schools taught arithmetic and Chinese language. The Ining Tatar School, set up in 1942, was one of the earliest modern schools for ethnic minorities in Xinjiang. It played an active role in reforming the old religious education and teaching science and culture. Many Tatar intellectuals earlier this century worked hard to set up and run schools. Some went deep into rural areas, and played a big part in establishing Xinjiang's educational cause. Their efforts benefited not only the Tatars, but also the Uygur, Huis, Kazaks, Xibes and Ozbeks. Most Tatars in cities live in flat-roofed mud houses equipped with flues for heating. They like to hang tapestry inside their homes, which are usually very clean and tidy. Courtyards planted with flowers and trees have the appearance of small gardens. 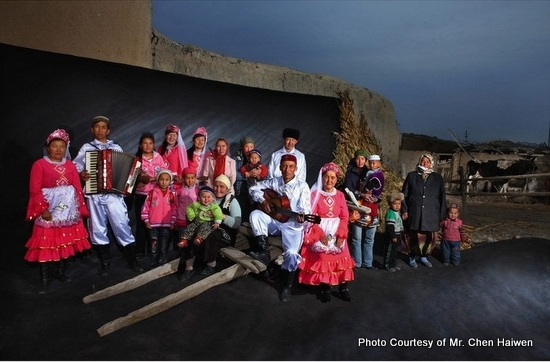 The Tatars in pastoral areas have adapted to a nomadic life, and live in tents. Tatar cuisine, popular in Xinjiang, includes various kinds of pastries. At festivals, they serve pastries called "Gubaidiai" and "Yitebailixi," the former being cured with cheese, dried apricots and rice, and the latter with pumpkin, meat and rice. Both kinds have crisp crusts and soft contents. Tatar drinks include beer-like "keerxima," made of fermented honey, and "Kesaile" wine brewed from wild grapes. Tatar men usually wear embroidered white shirts under short black vests or long gowns. Their trousers are also black. They often wear small black-and-white embroidered caps, and black fur caps in winter. Women wear small flowery caps inlaid with pearls, and long white, yellow or purplish red shirts with pleats. Their jewelry includes earrings, bracelets and necklaces of red pearls. Since liberation, more modern styles have influenced both men's and women's clothing, and a growing number of Tatars are now wearing Western style clothes. The cultural life of the Tatars is rich and colorful. Their music has a lively rhythm, and several musical instruments are used, including the "Kunie" (a wooden flute), the "Kebisi" (a kind of harmonica) and a two-stringed violin. Tatar dances are lively and cheerful. Men use many leg movements, such as squatting, kicking and leaping. Women move their waists and arms more. Their dance styles incorporate features of the Uygur, Russian and Ozbek dances, but also have their own unique characteristics. At festivals, the Tatars often hold mass dancing contests. "The Plough Head Festival" every spring is an annual grand gathering, held usually at beautiful scenic spots, and includes such collective games as singing, dancing, wrestling, horse racing and tug-of-war. The game they enjoy most is the "jumping walk" contest. All contestants hold an egg on a spoon in their mouths. The first to reach the finishing line without dropping the egg is the winner. Tatar drama began developing earlier than those of most other ethnic groups in Xinjiang.